Our party this weekend had a Nick at Nite theme. We rented spandex linen in electric colors of hot pink, green and blue. The centerpieces pulled the entire room together. We draped fabric from the ceiling to the table and puddled the fabric in vases. Lots of uplighting and gobos filled the walls. The munchies for the kids had lots of hand held containers..french fry cones, fresh veggies in cups with dip. We served mini milk bottles and cakes for dessert. There were several large Nick at Nite signs and a custom sign in book. We named the tables after all the old school t.v. shows. 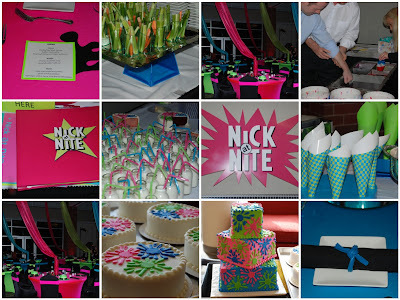 This entry was posted in Neon Party, Nick at Nite Bar Mitzvah, Nick at Nite Party on March 2, 2009 by Setting the Mood.